It may be flirtatiously sheer, somberly coloured and playfully dotty. The Dhakai Jamdani is a saree you want to take home to your parents. And introduce to your boss. And show off to your friends. Flirty, but deeply mature, the descendant of the legendary Muslin saree, the Dhakai Jamdani has many shades to its personality. And it begs your understanding. 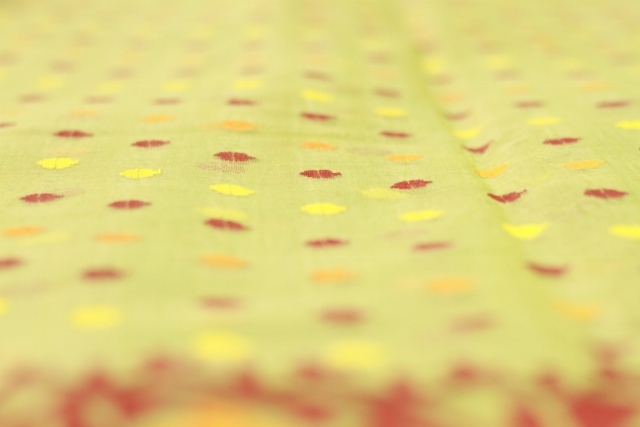 This Dhakai and other sarees that look similar to it – the Shantipur saree and the Tangail – have been unfairly clubbed as the ‘Calcutta’ or the ‘Calcuttee’ saree. This cruel generalization needs to end. For this is a unique, one-of-a-kind saree. Some of the terms that I came across while researching this saree are ‘high art’, ‘incomparable’ and ‘threads of wind’. I met this saree through my grandmother. She often narrated stories about her sarees whenever she did her annual spring cleaning. A saree that she never tired talking of at the time of each spring-cleaning event was the one-ring Muslin. The fabric that could pass through a wedding ring. Muslin, a fine, light, high quality cotton was made in Dhaka. Though there are records of it being woven in Masulipatnam, a small village in Andhra Pradesh. It was of course the Dhaka Muslin that was exported to the world and went on to achieve great fame and glory. 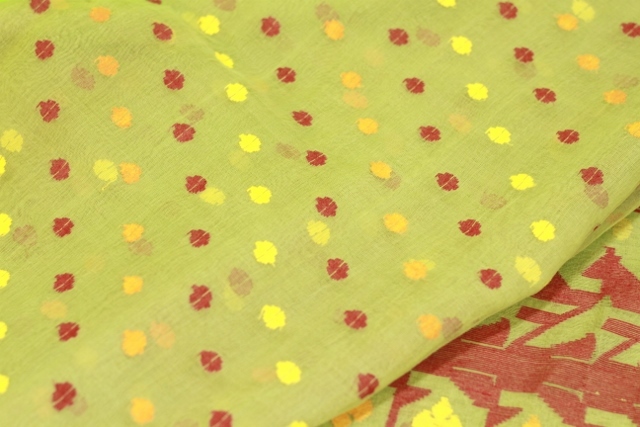 It is said that the Dhaka Muslin was so fine that 50 meters of this fabric could be folded and stored in a match box. The Dhakai Jamdani was originally woven on this fabulous Muslin. The weave is done in a way that feels like the motifs are embroidered on the base fabric. The effect is like that of an embellishment or an ‘inlay’. The Dhakai Jamdani is therefore also called the ‘Figured Mulsin’. What we see today as the Dhakai Jamdani is a result of centuries of design evolution based on various artistic influences. Today of course, the base of this saree could be Cotton, Mul, Silk of varying grades or Tussar. The designs of the Jamdani are first created on paper. 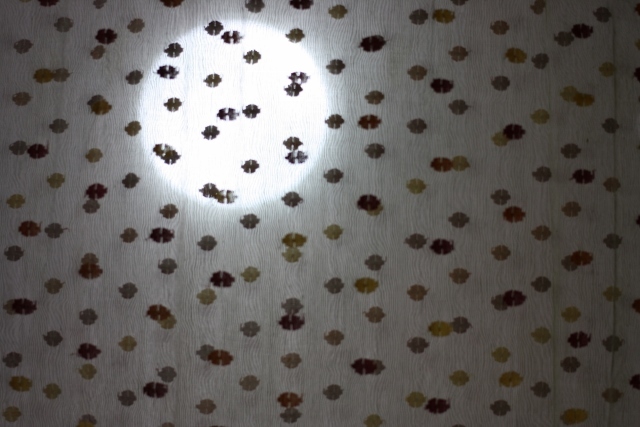 This paper is used to ensure that the motifs are created as per the design. Expert weavers however do not need any reference. The designs are created while weaving. So advanced is this type of weaving that the weaver needs to be attentive all the while. There is no mechanical or repetitive effort here. And all of this from weavers who are barely literate! The most distinctive feature of the Dhakai Jamdani is the use of geometry in its motifs. Be it a bird, animal figure or a ‘keri’ or any other typical saree design element, the shape is ‘geometrified’. It is said that this style is the result of early Iranian influence on the Jamdani design. The second most distinctive feature of the Dhakai Jamdani comes from the diaphanous legacy of the Muslin. Its sheer base with the thick embellished motifs gives it a delicate appearance. So when you see embellished motifs sprayed on a sheer base, its combined effect to me is of a ‘zari-wala aasmaan’ to borrow a phrase from Gulzar’s song. The butis on the Dhakai Jamdani are usually aligned in a straight line or they may be ‘tirchaa’ or diagonal. Sometimes when the base is given lots and lots of butis the design is called ‘panna hazaara’ or thousand emeralds. How beautiful that would look! The image shown below is a saree with a large number of butis and is called ‘butidar’ or full of ‘butis’. 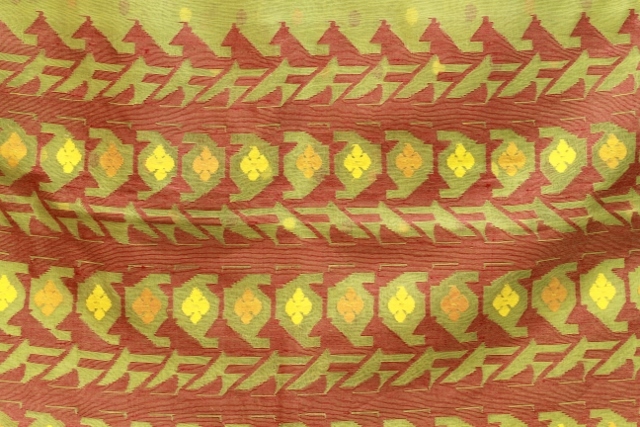 The border of the saree also has geometric versions of the ‘bel’ or creeper and ‘jhalars’. Jamdani has its roots in Dhaka, Bangladesh. They are made in a village called Ruposhi, popular as Jamdani village, situated on the banks of river Shitalakhya, about an hour’s drive from Dhaka. In India, the saree is now called Jamdanis are made in the town of Ambika Kalna or Kalna, on the banks of the river Bhagirathi about 95 kilometers from Kolkatta. Be it in Bangladesh or in India, the Jamdani is a treasured artifact cherished and worn on all important occasions alike. Several bodies like UNESCO have granted the Jamdani heritage status. All of this attention and importance however does little for the art to survive. The new generations of weavers feel that rigour and work involved in weaving does not fetch them the price or the glory. Thus they move away from the rigour of this intricate work to more lucrative and easier professions. If you decide to buy a Dhakai Jamdani, look for patterns that are geometric, look for base fabrics like Tussar, Silks and Cottons. Any colour or style you buy, the saree makes itself belong to you and I am not just saying this. If you look around, you will see women of all ages carry off this saree beautifully. I have to stop raving about the Dhakai Jamdani and save a few words for another D. D for Dharmavaram sarees. I must confess that I did not know much about these sarees and still do not know much. But I do have an interesting story to tell. How helpful was that! Fortunately, my research did land me some information from other sources. I found out that the Dharmavaram is very similar to the Kanjeevaram. Here’s why. Kanjeevaram sarees are in great demand the world over. They are expensive too. It was felt that this saree was beyond the reach of states closer to home — both by virtue of cost and availability. A small group of weavers in a village called Dharmavaram saw an opportunity here. They created their own version of the Kanjeevaram using two-colour yarns for weaving. The sarees turned out to have their own distinct look, but to the unfamiliar or untrained eye, they looked very similar to the Kanjeevaram. This saree also uses tested ‘zari’ instead of gold thus bringing down the overall cost significantly. Often called the ‘daily wear Kanjeevaram’, that then is the Dharmavaram for you. This logic aligns with what the salesman at the saree shop told me. The use of artificial zari is probably why the Dharmavaram is not as expensive. And that’s all I have to say about the two splendid sarees with the letter D.
In the now-famous words of Arnold, I’ll be back, next week with the letter E. Now which saree begins with E I wonder!